Today was my Mom’s birthday, and to celebrate I picked a delicious Tuscan restaurant located in Downers Grove. It is a chain, but for a chain they definitely put out a menu that would make you think it’s a unique family restaurant. I had been here before to celebrate a friend of mines birthday a few months ago, and I have been craving it ever since! What amazed me is that this restaurant is located near a mall, which means its surrounded by more than a dozen restaurants, some even comparable in menu and price range and it was still buzzing with business on a Wednesday night. The place was absolutely packed! Even so, we were seated quickly. The ambiance is very cozy and welcoming. White table cloths, dim lights and only the sound of chatter from surrounding tables. No loud music, no clutter of chotchkies hanging from the walls – just warm colors and some plants for a pop of color. 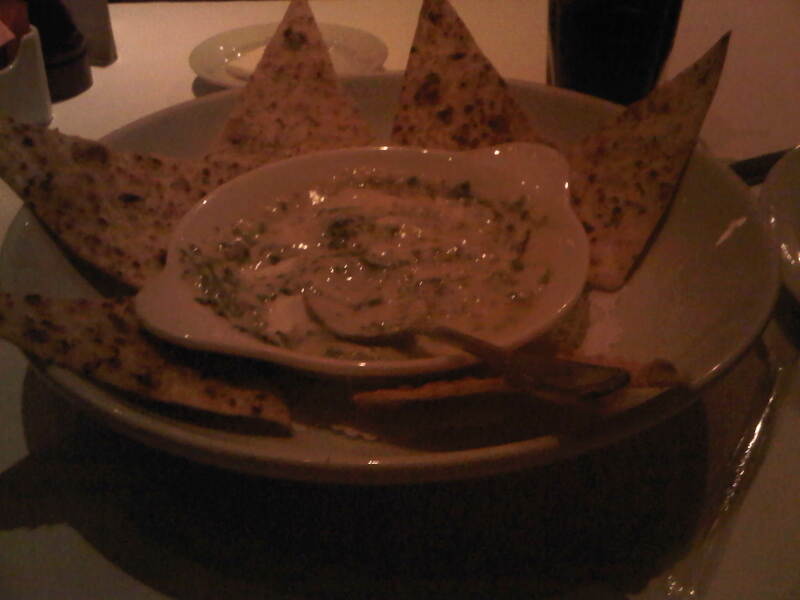 We started off with a spinach and artichoke dip. My mom absolutely loves this starter and anytime it’s on a menu she needs to get it. This was served on fresh flat bread triangles dusted with herbs and cheese. We also had warm sourdough bread, which I liked it better with. Who can turn down sourdough, especially when its toasty and warm! The dip was very tasty, the only problem was the portion was a bit small for how much it was and how much flatbrad it came with. I know I may have been generous on the amount I put on my flat bread, but not so generous that we had half of the flatbread left over. 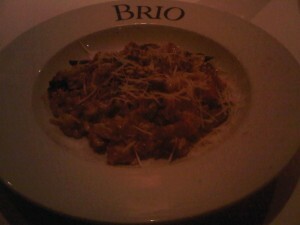 One of the things I love about Brio is dessert service. Rather than tossing menu in front of you full of pictures of desserts that never look that way when it comes out – the waiter brings tray of all the desserts they are serving. They explain all the delicious details and show you a real version of what your dessert will look like. It may make the decision harder to make, but its a small gesture that really makes the service great. Even though I do not love cheesecake, I went with the Raspberry Marscapone Cheesecake. If it was just Raspberry Cheesecake, I may not have been sold, but they had me at Marscapone. This was hands down the BEST cheesecake I have ever had. Very possibly one of the best desserts I’ve ever had (the strawberry shortcake from Gold Class Cinema is up there too). 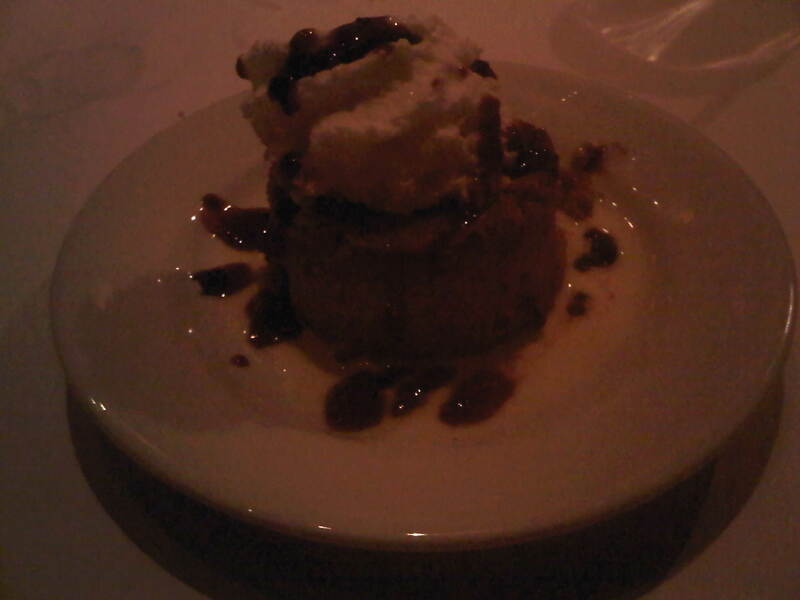 The cheesecake was so creamy and melt-in-your-mouth texture. It wasn’t dense and thick like some other cheesecakes are. It almost has a mousse-like texture. There were very warm spices that I couldn’t pin point exactly which they were, but I just knew I was in love with it. It was definitely a treat on such a dreary rainy Chicago evening. I highly recommend checking out the website and seeing if there is one near you. The service is friendly, the restaurant is cozy, food is delicious, and prices are very reasonable. Oh, can’t forget! – Happy Birthday Mom!